Pretzel Logic's Market Charts and Analysis: S&P 500 Reaches September's Downside Target -- What Next? 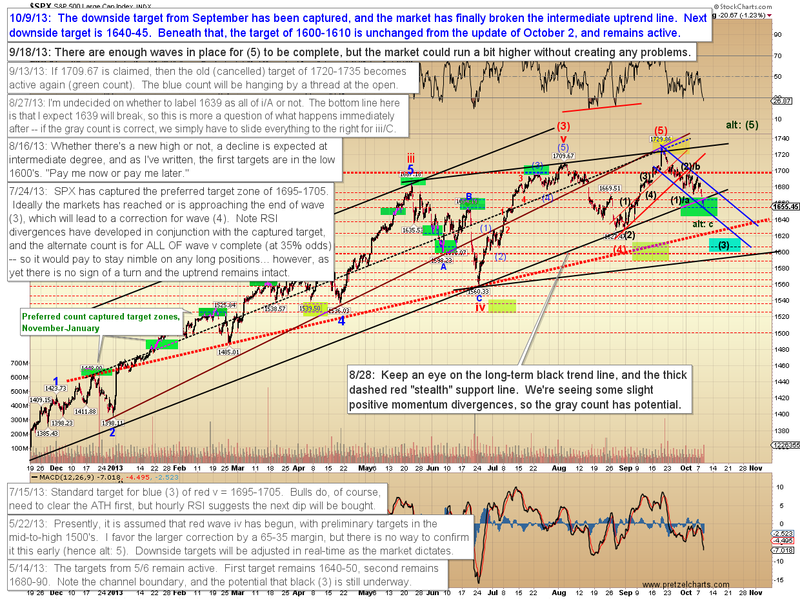 S&P 500 Reaches September's Downside Target -- What Next? Let's get one thing straight: The stock market is not anyone's friend. The stock market is a vicious and brutal killing machine which chops the unwary into tiny bits. Then, after it takes their last dime, it proceeds to head the direction they were hoping it would before they got chopped up. The stock market hates you -- especially when you make money from it. When you win, it wants that money back, and it will try to goad you into taking higher risks afterwards. Even as it pays you your winnings, it will laugh the way John Malkovich did in Rounders and say: "Fine. It's a joke anyway. After all, I am paying you with your money." One of the great cultural illusions still left over from the Great Bull Run is that the stock market is a friendly place, where ordinary folks can get rich. This illusion has been reinvigorated recently by the recovery of equities markets to fresh all-time-highs. But the market is not a friendly place: Equities are a process of price discovery, a whirlpool of liquidity, a zephyr of global uncertainty, and a casino-full of seemingly-friendly dealers who are happy to take your money and leave you with nothing. Every trade has two sides, and the person or institution on the other side of the trade you just took isn't buying or selling so that you personally can make money. Quite the opposite: Their goal is to make money too; so while it's not anything as insidious as "trying to make money at someone else's expense," the reality is that every single trade has a losing side. Which makes the stock market a financial battleground. Recently, we discussed that the charts were suggesting a pattern of buying that was premature, also known as a bearish nest of first and second waves. These 1-2 wave patterns are not only vicious to bulls because of their ultimate resolution lower; they're also vicious to unwary bears. The pattern tends to get shorts covering right when they should be holding. That's the psychology of the beast. Shorts have held through each of the wave two rallies and experienced lots of draw-down along the way, so they become increasingly anxious and skittish, and they become conditioned to expect another rally right when the third wave down hits. It's a war; the market wants everyone's money. Yesterday, the White House announced that Obama will nominate Janet "Stop with The" Yellen as next head of the Federal Reserve. Futures put in the obligatory "oh, hurrah" bounce on this news, which strikes me as a non-event. I doubt this announcement came as a big surprise to anyone who has cable television, though futures remain green as of this writing. 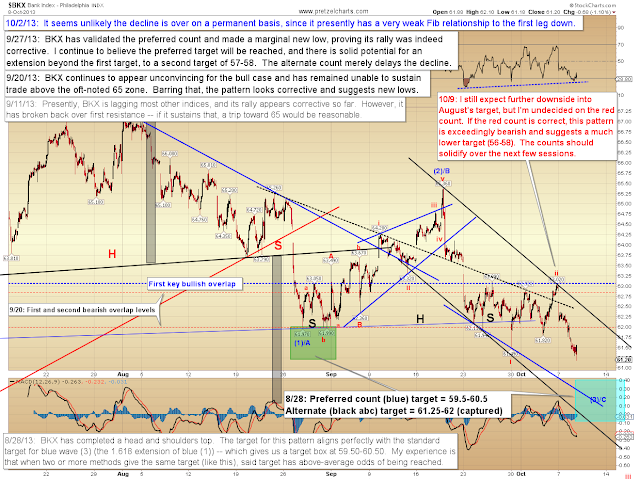 The first chart we'll look at is the S&P 500 (SPX) which has now captured September's downside target. 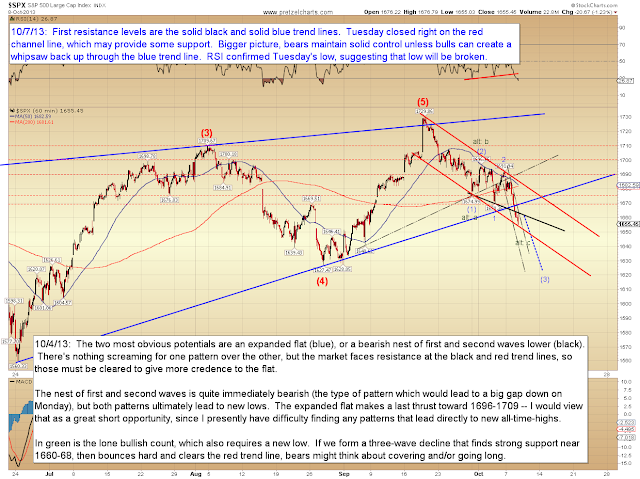 A small reaction rally, perhaps to revisit the key trend line which broke yesterday, would not be out of the ordinary. 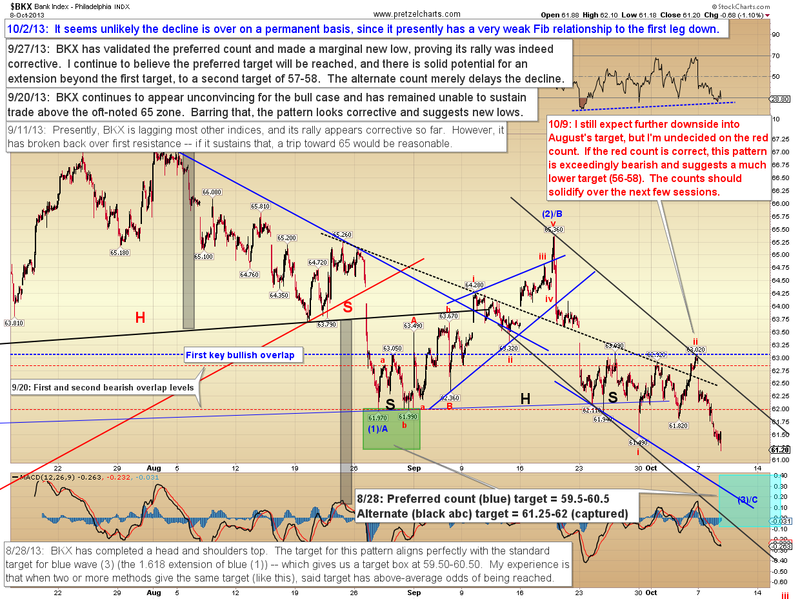 If the most bearish 1-2 count is unfolding, bounces should remain fairly muted for a time. The next downside target is 1640-45, which would be the target for the alternate bullish ABC count, and it will now require sustained trade above 1675 to call that into question. On October 2, I noted that the wave count appeared to be even more bearish than I'd anticipated up to that point, and added a lower target for the preferred count of 1600-1610. I've updated this chart to reflect that target, though part of me wants to add an asterix behind it, since it may need to be adjusted in real-time as the wave unfolds. Finally, the Philadelphia Bank Index (BKX) is, interestingly, still a bit shy of reaching August's preferred downside target. The red annotation was added for today's update. In conclusion, sellers accomplished exactly what they needed to yesterday, and broke through a key intermediate support line. 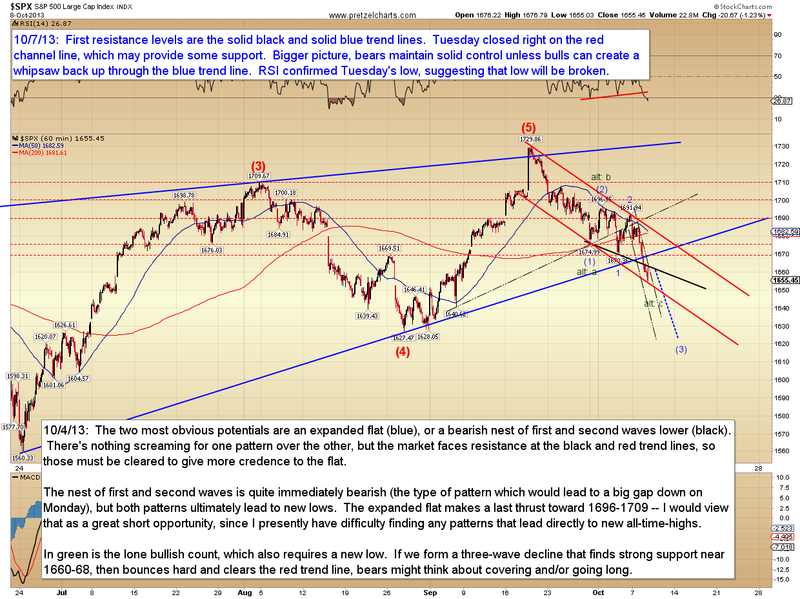 Most of the charts I've looked at suggest further downside awaits -- and if this is indeed a nested third wave, we still have a ways to go. Trade safe. Amazing how in every post you address the one single issue that is the most relevant to the specific day. And the bull/bear psychology war is precisely what is shaping the market right now. Bears covering too early creating more downside for early dip buyers etc...one request: you always do a great job framing the short-term within yhe bigger picture. What is your target for a nested 3? And do you label this leg down a c of a corrective A-B-C (with A having completed at the June lows and B at the September no taper knee-jerk) or a 1 of a 5 impulsive sequence? 1600-10 is the target for (3). Too many people forget that the stock market is a business and its job is to get your money. Could not have said it better myself. Just love it. Don't know what to do sometimes on days without a post from you. I also scan the forum (which you removed from your page???) for your posts. Keep up all the good work.